Keanu is currently a senior at the University of Alaska, Fairbanks studying Mechanical and Aerospace Engineering. Currently his goals are to obtain a bachelor’s degree and to start working for a company in the field of aerospace engineering. 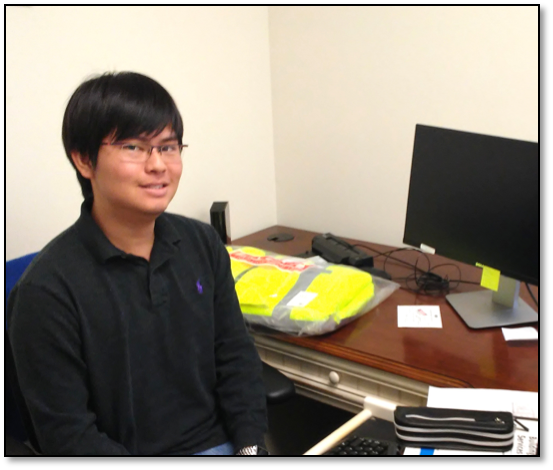 However, Keanu has recently found an interest working with modeling and finite element analysis, which might sway him toward further studies and research. Other than academics, some of his hobbies include cycling, archery, and building/flying radio controlled quad-copters. Mentor: LeEllen Phelps, Guillermo Montijo Jr. The construction of the Daniel K. Inouye Solar Telescope (DKIST) has been going on since January of 2013 and is currently approaching the final stages involving the functional startup of its thermal systems. In order to accomplish functional startup and commissioning of these systems, it is required that all of the subsystem components which make up the telescope’s thermal systems be tested and tuned to verify compliance in meeting the design and operational specification required for the telescope to operate properly. The purpose of this project is to generate both pre-functional checklists and general commissioning plans that will initialize the commissioning process of these thermal systems. During the checklist building process, drawings and component Installation, Operation, and Maintenance (IOM) manuals were utilized to determine the proper procedures of installation and operation specified by the component manufacturer. A majority of these installation procedures were then refined and transcribed to form the basis for each respective component checklist. Having completed the checklists, commissioning plans were then generated using templates from previous building projects. These templates were modified and completed using information relevant to the DKIST project such as construction phases and specific management protocols. As a final product, a total of four pre-functional checklists were generated; these cover major components such as centrifugal pumps, heat exchangers, air handling units, and chillers. Commissioning guidelines were also completed and are focused on the pre-functional phase of the commissioning process.